Length: 77 hrs. 6 min. This star-studded audio production of the Old Testament of the Bible is the long-awaited follow up to the award-winning and best-selling Word of Promise® New Testament. 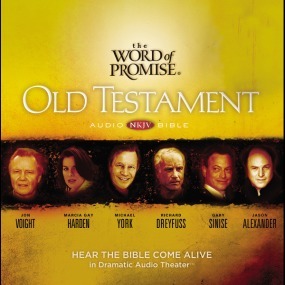 This faithful rendering of the New King James Version® is presented in a compelling, dramatic audio theater format and features performances by Richard Dreyfuss as Moses, Gary Sinise as David, Jason Alexander as Joseph, Max von Sydow as Noah, Marcia Gay Harden as Esther, Stacy Keach as Job, Joan Allen as Deborah, and Jon Voight as Abraham. The original music score by prolific Italian composer Stefano Mainetti (Abba Pater) and a feature film-quality sound design produced, engineered, and mixed at a post-production facility ranked in the top 3 in the nation are woven together with compelling narration by Michael York and the work of over 400 actors.